There are numerous nail dipping systems. However, all the systems are not the same since some make use of different methods of application to achieve the end results. Moreover, each system comes up with different formulations, colour and features. Each of these factors distinguishes the systems hence giving birth to diverse brands of dipping systems. For example, there is a difference in the operation of SNS dipping system compared to the several other systems like the OPI dipping system. This is because the SNS nail powder and OPI dipping powder have various differences that need to be considered when it comes to the process of application. Can Dipping System Liquids Be Mixed? To come up with durable nail tips, the liquid that you apply on the nails are the key ingredients. They work in a specific way to create the desired perfection. Therefore, unless if you are aware of the end product of your mixture and its functionality, the liquids might react and the results may not be pleasing. Therefore, it is necessary to follow the instruction provided the manufacturer in order to get the best manicure. Sticking to a specific liquids brand is recommended since each of the liquid and powder complement each other in the system functionality. It is also recommended that you make use of all the liquids provided by a certain nail dipping system. Liquids from other systems might not be compatible with the components of the other system hence negatively affecting the expected result. Thus mixing liquids is forbidden. In order to avoid errors in your manicure, you should stick to liquids from a specific brand. Can Dipping Powders Be Mixed? Powders provide you with a little more space for you to play. Having a variety of powders can spice up the look on your nails by producing a unique colour that can be admired by everyone. You can use liquids from a specific system like Gelish dipping liquids with powders from another system like Kiara Sky dipping powder or OPI powder perfection. You can also mix different powders from different systems but make sure that the liquids are from one system. Mixing creates a variety that is known to be the pizazz of mortality. Coming up with different mixtures that create different shades increase the chances of having a nail coat that is unlike any other coat was worn by anyone. After you have collected all the liquid and the powders you wanted, follow the keenly the procedure of applying the powders to get the best results. How Is A Nail Dipping System Applied? There are some common steps in the application of the dipping system. All systems first shaping the nails using a file. The cuticle is then pushed back and the shine from the cuticle area and natural nail plate are removed. The dust is removed using a brush and then the colour application procedure begins. Colour application is what varies among systems. 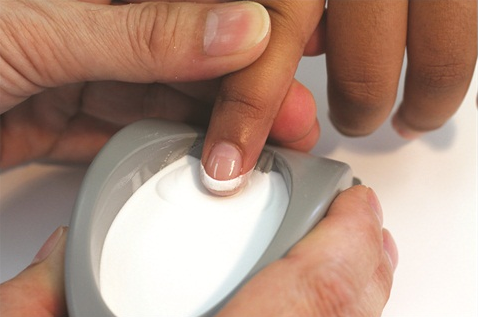 A nail dipping system refers to all the liquids and powders in a specific brand of dipping system used for a manicure. There exist different systems where each one of them has its specific components and mode of application. The application procedure may vary especially in the part of the colour application but the initial steps are the same. The components of each nail dipping system work together to create a long lasting coat that makes the nails stronger, healthier and prettier. Powders from different systems can be mixed and used but liquids should not.